The focus of Squad #18 was to be another jaunt away from the hallowed shores of Great Britain. This time we found ourselves back in the familiar surroundings of The Gunmakers and then virtually fled to the land of former colonies where co-founder Jason is currently exiled – the United States of America. Jason couldn’t make it due to the large body of water in the way, leading to the now usual array of Twitter transmitted jealousy, leaving other founder Andy and original whisky Gandalf Darren Rook to hold court, with an anonymous bald(ing) fat man occasionally chipping in when Darren got too wrapped up in his multi-page tasting notes (cheesecake? really?). Anyways, whiskEy time. First up was something that didn’t look a lot like whiskey, with or without an extra E. Concealed behind the usual paper label, in this case Page 3 of The Sun in an attempt to add an unneeded element of seediness to the first drink (in any case, a subconscious prudishness overtook the bottle wrapper and all naked flesh was facing the glass), was a jar of clear liquid that did not take too well to controlled pouring into a Glencairn glass. A quick deployment of one of the pipettes that I had liberated from work earlier in the day and we had a table of glasses filled from the jar. On the nose it was popcorny to start, with butter and grain, as well as some bitterness and sourness at the back, a bit like Granny Smith apples. To taste the corny motif continued, with a big burst of sweetcorn leading to hints of lemon, young spirit, cream and sugar. It hung around for a bit with a finish that started with fake butter diacetyl and gradually turned into more pleasant butterscotch before disappearing. 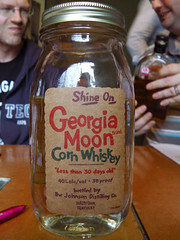 The paper came off to reveal part of a naked lady and a jar of Georgia Moon Corn Whiskey, although the word whiskey is stretching the definition slighty as the label also guarantees that it is ‘Less than 30 days old’. This is white whiskey, aka white dog, aka, especially in this case, moonshine – pretty much unaged corn spirit. While uncomplicated, and a drink that for some reason makes my younger brother’s gums bleed on contact, it is worryingly drinkable: sweet, buttery and good chilled. Number two was a slightly more distinctively shaped bottle, but it too had a neck related issue – US bottles don’t seem to like fitting UK sized pourers. Darren had brought one along in an attempt to make it easier to moderate our pouring of the traditionally much stronger American whiskies, but unfortunately it just rattled around in the neck holes so it was abandoned in favour of honour and steady hands. This second whiskey had a big and gluey nose with cinnamon, oats, cloves, honey, parma violets, Weetabix and a green & grainy edge. To taste it was sweet, really spicy (with a nice big tongue prickle) and grainy with a bitter edge. It also had a bit of butter and hint of mint, leading to my note of ‘Murray Mints’. The finish was surprisingly long, with sweet grain, cream and a big Weetabix finish – mushy Weetabix with a nice sprinkling of golden sugar. 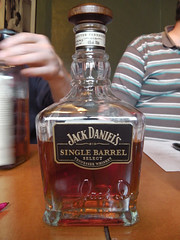 This one was revealed, to no great surprise, to be Jack Daniels Single Barrel. Predictions of strength all went a bit higher than the actual 45% of this one – the prickly tongue effect fooled everyone. The mashbill of this has a higher proportion of rye than other Jack Daniels recipes and rye is good at adding a prickly spice to the mix, a spiciness that is often mistaken for alcoholic strength. Much to my embarassment I think this was probably my favourite of the night – sweet, spicy and well integrated. 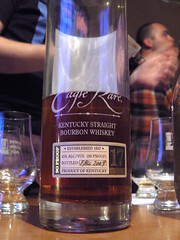 We next moved on to another that I had a sneaky suspicion from the bottle shape – one advantage of almost every bourbon brand having their own bottle is that it does make it easy to look more knowledgeable than you are at blind tastings. My ability to recognise bottles from merely their tabloid covered outlines shocks me only slightly less than the ability of my RAF Cadet Corps friends from school to pick out Tornado variants from a glance at a postcard while overburdened with overly woolly uniforms. Enough random cultural reference, this one had a nose of vanilla essence (the fake stuff that we used to make cakes from when I was a kid), meaty sherry, raisins, grain and a lot of traditionally ‘Scotch-like’ flavours, although with the hollowness that I often find in bourbon noses. To taste it started off sweet, with violets and a big spicy rye punch, souring as it moved on. It finished quite lightly to start, gradually developing into spicy polished wood. This one was revealed to be Four Roses Single Barrel, a whisky that I’ve read a lot about, tasted a bunch of times and always found that in the end I’m not that big a fan – annoyingly this was another of those times. It’s got the most interesting manufacturing tale of the lot, with 10 different recipes being made up by Four Roses (2 mashbills and 5 different yeasts), matured in different bits of their warehouses (each varying environment changing the maturation characteristics – the 6 tall stacks of barrels can get quite high, with a lot of temperature and humidity variation from warehouse to warehouse and from floor to ceiling) and then combined in varying quantities to produce each of their expressions. According to the rather good article in issue 93 of Whisky Magazine (March 2011 – ta muchly Dave Broom and Marcin Miller) the Single Barrel comes from the OBSK recipe – mashbill OB and yeast K. OB has a big rye content, 35%, the highest for a straight bourbon (straight bourbon being, amongst other things, a whiskey made with at least 51% of the grain used being corn) according to Four Roses Master Distiller Jim Rutledge, and the V yeast brings more delicate fruit, matching spicy rye with a gentle fruitiness. 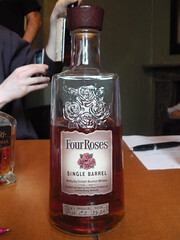 I keep coming back to Four Roses, though – I very much want to like it but as yet haven’t quite made it. Fourth was a whisky that no amount of plane spotting helped me identify from shape alone. On the nose it was very dry and malty without much sweetness – just a hint of raisin. There was also a bit of smoky wood in the mix as well. To taste it was very savoury, with nettles, blackberry leaves, stewed tea, pepper and a big chunk of grain. It finished woody, with a chunk of vegetation – ‘Forest floor’ my notes read. 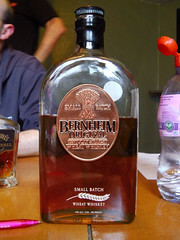 The wrapper came off and the flavours made a bit more sense, as it was Bernheim Original, a wheated whisky. I’ve been meaning to try wheat-heavy whiskey for a while (straight wheat whiskey has to be at least 51% wheat, rather than rye or corn), with a couple of MoM samples knocking around on one of my shelves waiting for a free evening, and have often wondered how it would vary in flavour and now I know – very dry and savoury, with quite a lot of dry grain to the flavour. This was the most interesting whiskey of the night but while I want to try it again I suspect it’s not for me and my current sweet-craving palate. Fifth was a bottle that I again recognised, although not to any great effect – it was the tall thin shape shared by all of the entries in Buffalo Trace’s Antique Collection. 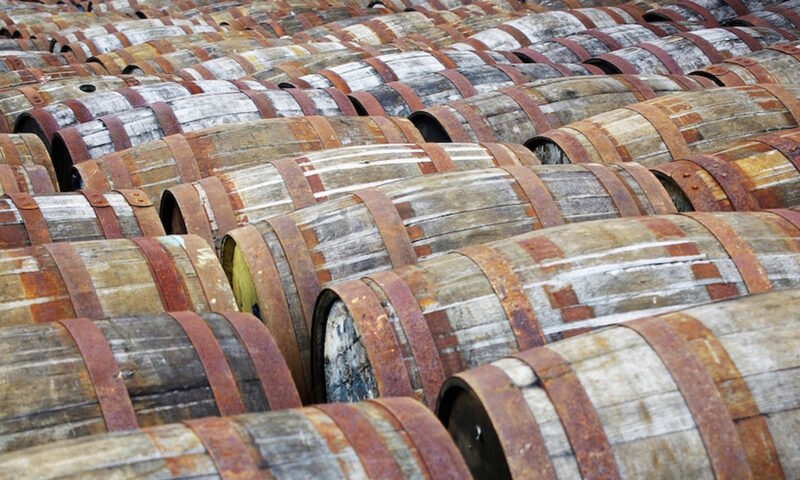 One of the things that pops up much more in American whiskey than in Scotland is distillers making multiple brands of whisky – there are a lot more brands than there are distillers in the US. Buffalo Trace, according to Wikipedia, produce 14 different whiskies for themselves and other companies at their distillery. However, Trace is owned by Sazerac, who in turn own a number of other distilling companies – it’s all a bit more complicated on the other side of the pond. This one was presented at the same time as #6, also in the same type of bottle, to allow us to compare and contrast the pair. This one was pure Fry’s Turkish Delight on the nose – not only the pink pretend rose middle, but also the sub-easter egg chocolate on the outside. Along with that it had a bit of a mishmash, with sweetcorn, menthol, passion fruit and mulchy lemons. To taste it was quite drying, with tannic white grape skins, sweet and salty butter and a cooling finish of woody menthol. 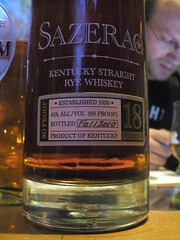 This one turned out to be Sazerac 18 year old, a long aged (as American whiskey has to be matured in new oak casks, which combined with the environment leads to the whiskies picking up flavour from the wood more quickly than in Scotland) straight rye whisky. The Antique Collection is all done in batches and this was the Fall 2009 release – Jim Murray’s World Whisky of the Year in 2010. An impressive whisky, but it seems that a big rye hit isn’t currently to my taste. Another informative evening of random boozes, lightened by further tales of youthful misadventure by Whisky Guy Darren and an occasional green glow from the dark corner of the room as Andy puffed away on a newly acquired electric cigarette. The next month’s meeting is already up, potentially sold out and intriguingly titled ‘Grape and Grain’. I know what that means, and have already identified a couple of potential extra random donations to the evening that may find their way into my bag, and am looking forward to seeing some intrigued faces as they taste some strange whiskies. I don’t know if you’ve only had the Single Barrel, but the Four Roses Small Batch might be more your speed. A bit more of a traditional bourbon, most tasty. The Small Batch is my favourite of the lot so far and one that I need to revisit when I have some of my other standard bourbons to hand.